HA NOI (VNS) — The Thang Long Project Management Unit has forwarded a proposal to the transport ministry on building the Viet Tri – Ba Vi Bridge under the BOT (build-operate-transfer) model. The investment capital for the first phase of the project will be nearly VND1.5 trillion (US$69.4 million). About 85 per cent of the investment capital will be borrowed from banks. The payback period for the project is expected to be 22 years and one month via toll collection. The construction of the four-lane, 9.5km-long bridge across the Hong (Red) River, connecting Ha Noi with the northern Phu Tho Province, is scheduled to begin on April 28. It comprises approach roads with a total length of 7.8km and a main span of 1.7km. 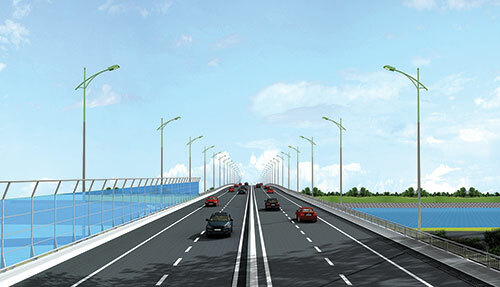 The first point of the bridge will connect with National Highway 32C in Phu Tho Province's Tho Son Ward, and the last point will connect with National Highway 32 in Ha Noi's Phu Son Commune. If the transport ministry clears the proposal, the bridge will become operational after 18 months of construction.